Oklahoma Money Matters, the financial education initiative of the Oklahoma College Assistance Program (OCAP), strives to help people take control of their money and make positive financial choices. Identity theft is a growing issue and it can take a lot of time and effort to repair the damage. It’s important to take special precautions to protect your personal information, so we created Tips to Avoid Identity Theft, a short video that explains how to guard your information from would-be thieves and what to do if you suspect your identity has already been stolen. The video is available on OCAP’s YouTube Channel and on the Videos page at OklahomaMoneyMatters.org. Feel free to share this video or link to it from your website. The 2019–20 FAFSA is here! Here are a few tips for students. Oklahoma Money Matters (OKMM), the financial literacy initiative of the Oklahoma College Assistance Program and the Oklahoma State Regents for Higher Education, is proud to announce the newest addition to our financial education library, Understanding Your Credit Score, a lesson plan for adult learners. Understanding Your Credit Score was carefully crafted with the economically vulnerable learner in mind and is divided into five sections to allow for more flexible utilization. Each section concludes with an application exercise and bonus material that complements the lesson. Participants will explore the factors that make up a credit score, learn how to access and review their credit reports, discover strategies for reducing debt, and learn the importance of making wise financial decisions that can help them reach their financial goals. 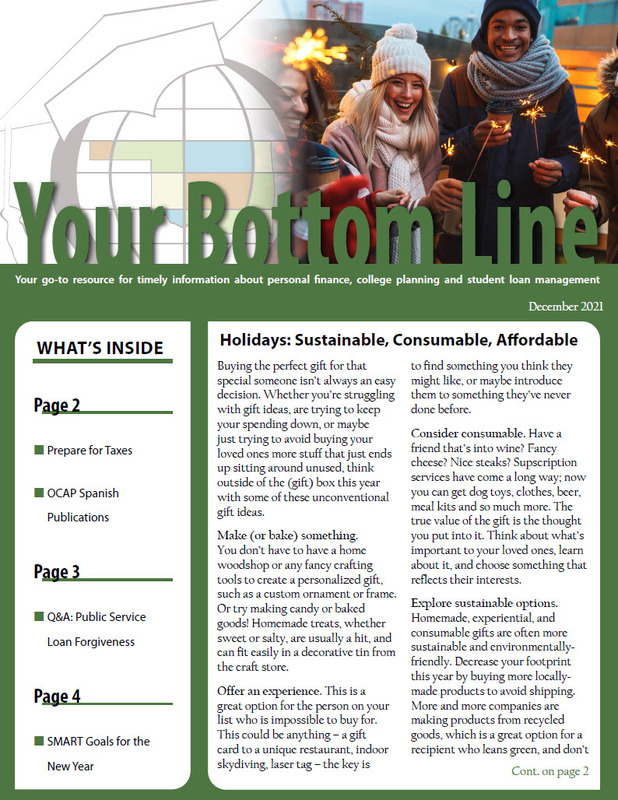 Both the Understanding Your Credit Score lesson plan and its corresponding Your Money Matters: Your Money, Your Way guide can be downloaded for FREE of charge from the resources page of OKMM’s website. If you would like to schedule a workshop, request materials, or learn how OKMM can help you incorporate personal finance education within your existing service structure, please email OklahomaMoneyMatters@ocap.org or contact us at 405.234.4415 or 800.970.OKMM (toll-free). I'm in School and Need Money to Pay for It, What Now? How Much Do I Owe On My Student Loans? I've Missed Some Student Loan Payments, Can I Get Back on Track? These short videos outline specific steps to address these common issues. The videos are available on OCAP’s YouTube Channel and on the Videos page at ReadySetRepay.org. Feel free to share these videos or link to them from your website. Oklahoma Money Matters, the financial education initiative of the Oklahoma College Assistance Program (OCAP), strives to help people take control of their money and make positive financial choices. Learning to manage credit is a crucial piece of the personal finance puzzle, so we created What Factors Determine Your Credit Score?, a short video that explains the six basic categories that factor into your credit score and simple steps you can take to maintain a positive credit history. The Oklahoma College Assistance Program (OCAP) recognizes the impact default prevention has on the mutual success of institutions and borrowers. Helping schools excel in this area is what led Mary Heid, OCAP’s executive director, to work with Student Connections, a nonprofit affiliate of USA Funds focused on enhancing student success in college and career. Under Heid’s leadership, OCAP forged an arrangement with Student Connections to provide default rate management support to 26 Oklahoma campuses with CDRs (cohort default rates) above 10 percent. The agreement provides the schools with the ability to offer comprehensive grace period and default prevention counseling to their borrowers. Student Connections grace counseling informs borrowers of all options, which may include a return to school. In all cases, the objective is to determine the course of action best for the borrower’s individual circumstances. Since the OCAP partnership with Student Connections began, students who underwent grace counseling were more than 40 percent less likely to enter delinquency on their student loans. Read more about the Student Connections-OCAP partnership at the Student Connections website.